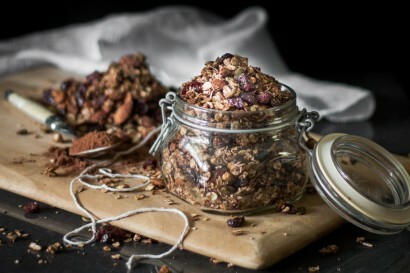 Healthy Chocolate Granola | Tasty Kitchen: A Happy Recipe Community! I am sure there are plenty of moments in your life where don’t have the time to make a great-tasting breakfast. However, what if you could wake up to a nice big jar of chocolate flavoured granola that’s healthy? Let me show you how to do this. Preheat oven to 150ºC (300ºF). Mix oats, pumpkin seeds and crushed almonds in a bowl. 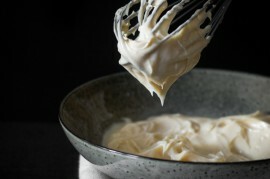 Put honey and vanilla extract in a small pot or pan. Heat honey until it thins, then add to oat mixture. Mix honey through until every oat, nut and seed is covered in honey. Add cocoa powder and cinnamon, then mix through. Spread granola out onto a baking tray and bake oven for 20–25 minutes. Take granola out, give it a good mix, then put it back in the oven and bake for another 20–25 minutes. Once granola is done, take it out and let it cool for about 10 minutes. Add cranberries and mix through. Store in a jar. Granola is ready!